There are no records of oyster middens or wild oysters for coastal Hancock County or Washington County, likely because the region’s waters historically were too cold for oysters. However, the American or Eastern oyster (Crassostrea virginica) is native to Maine, and was present in significant quantities in certain locations, as evidenced by piles of discarded oyster shells in Damariscotta and Newcastle in Midcoast Maine. The Damariscotta middens were left by the region’s native peoples between 3,000 and 1,000 years ago, when oysters flourished in the warm seawater that followed melting glaciers (Sanger and Sanger 1997). Some think that Native people ate the shellfish close to their source, since soup bones found among undisturbed shells and the presence of charcoal indicated cooking on the immediate shore. Moreover, shells were not packed irregularly as though dumped in masses, but they lie flat as though thrown on to the pile one by one. It has even been suggested that the heaps represented a “primitive wholesale enterprise in drying and even trading oysters” (Goldthwait 1935). As deglaciation continued, rising sea levels made the Gulf of Maine cooler and saltier, restricting oysters to the upper reaches of estuaries, where most eventually declined to extinction. Anthropologist David Sanger posits that as sea level continued to rise, the salt water brought with it predatory snails known as oyster drills and other marine animals, which, in addition to cooling temperatures in the Gulf of Maine and harvesting, caused the oyster population to crash. Later, European settlers lined the shores of the Damariscotta and other tidal rivers with brick yards and sawmills, excavating some of the middens and clearing the land of trees in the process. Midden shells were ground into chicken feed, burned for lime, spread on roads and driveways, and used to fertilize gardens. Clay silt, sawdust, and soil washed into the river, making the water inhospitable to any oyster that attempted to return. Southern New England, where oysters were once the most popular seafood, also experienced declining oyster populations in the middle of the nineteenth century. But Connecticut and Massachusetts fishermen soon learned they could successfully transplant and cultivate oysters, and by the 1850s state governments were granting, later leasing, ownership of the sea bottom to oystermen on which they could cultivate or ‘farm’ their oysters (Oliver 1995). Remnant populations survived into the twentieth century, or else re-colonized habitat. In 1935, Goldthwait noted that Maine oysters were restricted to “rocky current swept estuaries” including Sheepscot Falls and the Damariscotta. In 1949, the Department of Sea and Shore Fisheries (predecessor to the Maine Department of Marine Resources) introduced to Maine the flat or European oyster, Ostrea edulis, the same species as the legendary Belon oysters of southern France. Fisheries managers imported flat oysters from Holland, screened them for disease and parasites, and planted them in Basin Cove, Harpswell, Boothbay Harbor, and the Taunton River in Franklin (Welch 1963). More were introduced to additional central Maine locations in 1954. The experiment didn’t take off the way the agency had hoped (because of cold winter temperatures and a lack of hard bottom needed for establishing beds). The oysters in Franklin did not survive. However, a few hearty European oysters did take hold and established wild populations in the Boothbay Harbor region. In 1972, Herb Hidu, a professor at the University of Maine, began investigating the cultivation of oysters in Maine waters, along with Ed Myers and other entrepreneurs. With funding provided by Sea Grant (in fact, the very first Sea Grant funding in Maine), Hidu developed methods to culture the European oyster in the Damariscotta River adjacent to the University’s Darling Marine Center. In addition to being naturalized in Maine waters, the European oyster was unique and different, and had market potential. Experiments were successful, until the parasite Bonamia arrived in the mid-1980s and wiped out almost all of the European oysters. With the European oysters devastated by disease, Hidu and the next generation of students reconsidered the native species and continued their research into the 1990s, this time focused on Crassostrea virginica. Today, there are approximately 30 licensed oyster growers in the state, including three operations in Hancock County: Bagaduce Oyster Company and Little Island Oyster Company in the Bagaduce River, and Taunton Bay Oyster Company in Taunton and Hog bays. Cowger, J. 1975. Occurrence of the American oyster, Crassostrea virginica, in Maine and its relevance to the Critical Areas Program. Augusta, ME: State Planning Office. Galtsoff, P.S. 1964. The American Oyster: Crassostrea virginica. Fisheries Bulletin of the U.S. Fish and Wildlife Service, V. 64. Washington, D.C.: U.S. Government Printing Office. Galtsoff, P.S. and W.A. Chipman. 1940. Oyster Investigations In Maine. Augusta, ME: Maine Department of Sea and Shore Fisheries. Goldthwait, R.P. 1935. 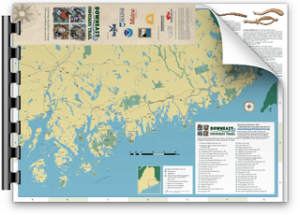 The Damariscotta shell heaps and coastal stability. American Journal of Science Series V 30(175):1-13. Harriman, D. 1964. American oysters in Maine. Augusta, ME: Maine Department of Sea and Shore Fisheries. Oliver, S. 1995. Saltwater Foodways. Mystic, CT: Mystic Seaport Museum. Sanger, D., and M.J. Sanger. 1997. The Damariscotta Oyster Shell Heaps. Northeastern Naturalist 4(2):93-102. Welch, W.R. 1963. The European oyster, Ostrea edulis, in Maine. Proceedings of the National Shellfisheries Association 54:7-23.